ATV 4 is a multi-blend synthetic oil specifically designed for High Performance four stroke sport and utility QUADS that use the same lubrication for the engine and transmission. ATV 4 uses advanced chemical research to blend only the finest additives to produce a oil that protects and cools the engine long after conventional 4 stroke oils have broken down. ATV 4 oil clings to vital engine components to protect and cool the engine under the most severe load or racing conditions. Eliminates pre-ignition that can cause upper end damage and poor performance. ATV 4 improves gear box shifting and eliminates clutch fade due to higher temperatures. 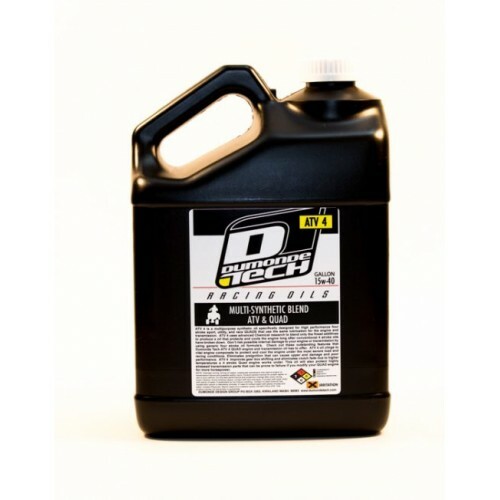 This oil will also protect highly stressed transmission parts that can be prone to failure if you modify your QUAD engine for more horsepower. Very good performance in auto clutchs against oil break down caused by the heat they create.